Wow. I think someone messed up my request for snow on my birthday. 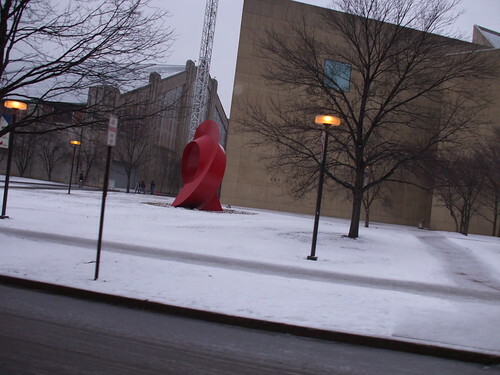 We got a little bit of that yesterday, but on my way home I was pelted with sleet. Thousands of tiny icicles assaulted me from above, each hitting my face at high velocity, like a constant stream of pins being stuck in my face. 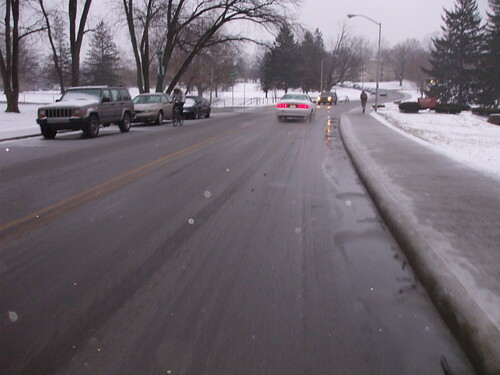 The roads were a mixed bag; some were clear, some had varying mixtures of snow, slush, and sleet covering them. Traction wasn’t bad but I would’ve been screwed without my knobby tires. I took a few photos on my way home when conditions allowed. Dear Tioga, GT, Kool Stop, and SKS: how about some sponsorship? Shimano: ditto on the sponsorship. The bike path was treacherous as usual and the roads near my apartment were pretty bad, too. I got home and got the mail, finding the Pink Floyd jersey I won in Noah’s contest in my mailbox. Fortuitous timing, having that arrive on my birthday. Thanks, Noah! I decided that what I needed most at this point wasn’t to sit in my nice warm apartment — it was beer. And I’d get it on my bicycle, of course. I rode to the nearest liquor store, which is about a mile away. Conditions were getting worse and I started feeling some of my mountain biking skills coming into play as I rode through snow/slush drifts*, shifted my weight back to let my front wheel roll over anything in my way, and felt fairly comfortable with the fact that my tires were drifting beneath me. 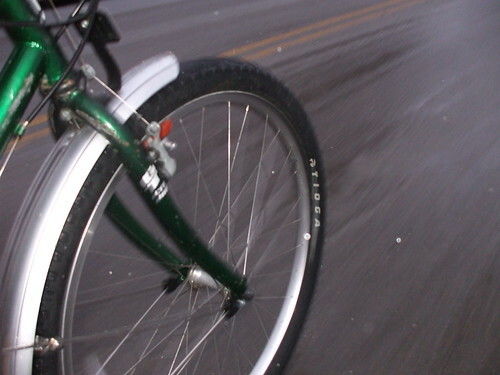 I probably stayed under 10 mph most of the way — but who knew 10 mph could be so exhilarating? * Yes, apparently slush can drift. I didn’t think so either, but I saw it with my own eyes. I got a six-pack of Bad Elmer’s Porter from my favorite local brewery, Upland. I wasn’t sure if this was the best way to go, because I intended to go have dinner at the brewery and if I did I’d get plenty of Upland beer then. But the conditions being what they were, I figured I ought to have some on hand anyway. The cashier commented, “You’re a braver man than I” for riding in those conditions. I pointed out that I got home before my coworkers finished scraping the ice off their cars. I forgot to mention that I had fun doing it, too. He said he rides to work sometimes when the weather is better. Excellent. My ride home featured more tire slippage but otherwise was pretty good. 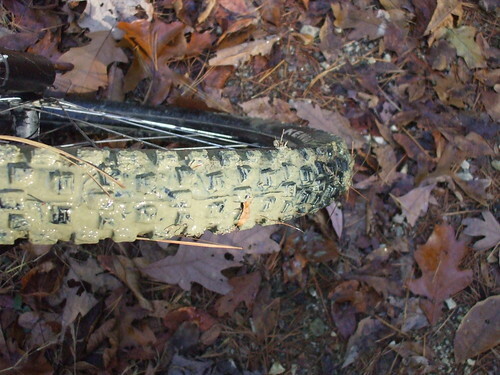 I am really impressed with how well my old mountain bike fares in conditions like these, even without studded tires. 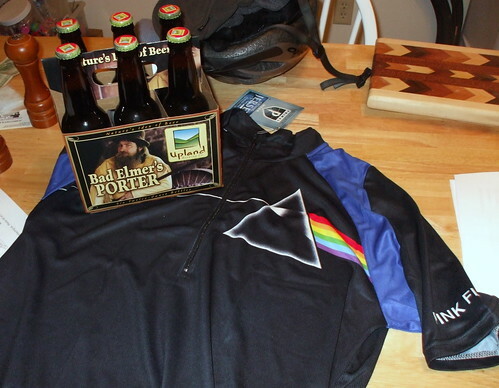 Birthday goodies: Pink Floyd jersey and some nice dark beer. Score! The jersey fits pretty well. Side note: I have a lot of reflective items in my dining room. Sarah had a late class that’s not scheduled to get out until 8:30. They got out at 8, so I picked her up and we went to Upland for dinner. 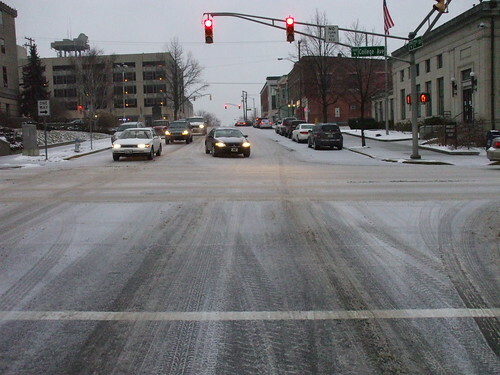 The roads were not in great shape, but drivable. I was cursing at a cop car who stopped right in front of me at the bottom of a hill for no apparent reason, then decided to turn. I wanted to use momentum to get up the hill, and I still made it, but not without spinning my tires a bit. We had a great dinner with poor service at Upland (as always), and drank a couple of beers. I had a nut brown ale with dinner, which is decent, but the highlight was their chocolate stout, which makes for an excellent dessert. After we got home, Sarah gave me my birthday gifts. They are uber cool. She got me a titanium backpacking cook set and a tiny alcohol stove, along with some freeze-dried food to go with them, and a bottle of stuff to waterproof maps — continuing the recent theme of touring items as gifts. This theme rocks, since I really want to do some S24O trips and touring, and you need a fair amount of gear to do those things. Oh, and she also got me a gift certificate for Rivendell — cleverly, the amount is listed in “Rivendollars.” Sarah apologized for giving me practical items as she said they’re “not very exciting.” But I don’t think she quite realizes just how exciting a stove smaller than a hockey puck is, or how great that titanium cookware will be. Before long I’ll be able to carry everything I need on a bicycle, and that is exciting. 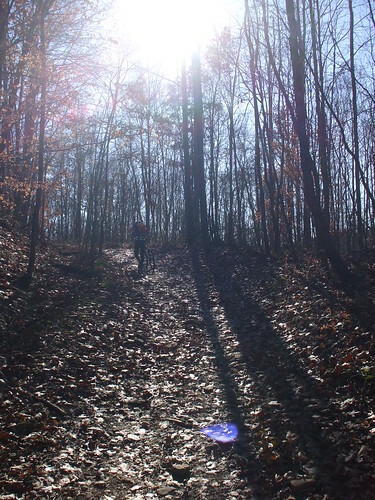 Last year, Dave and I spent Black Friday riding at Versailles State Park. 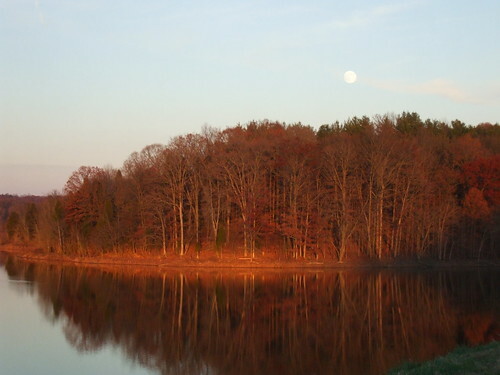 This year we decided to head south instead of east and discussed possibly going to Ferdinand State Forest, but ultimately settled on riding in Hoosier National Forest which is in the same area. Dave picked me up at around 9:00 Friday morning and we set out on the two-hour drive there. The drive was particularly scenic since once you get past Mitchell things get even hillier, with some beautiful karst topography. We passed some pretty interesting places and it was great to have Dave as a guide as he is familiar with the area and told me about how the town of English, IN was built on a flood plain and after having the whole town flood many times, they decided to move the whole town to the top of a nearby hill. They let a lot of the buildings stand in the flood plain and I really wish I could have gone to see the strange ghost town. The remains were torn down several years ago. 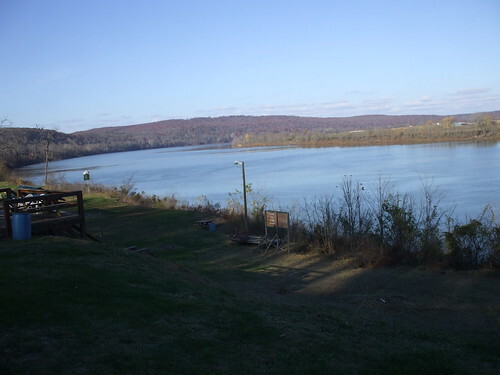 Nowadays, there’s nothing but a golf course in the flood plain. We also stopped at the Orangeville Rise of the Lost River. 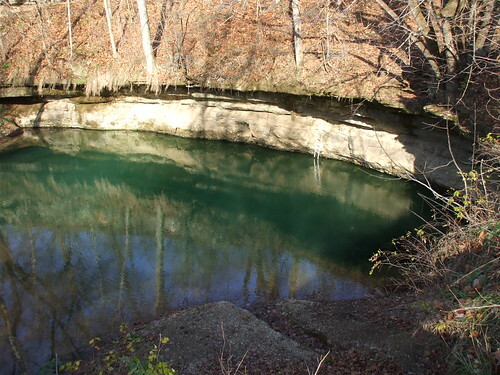 The Lost River is a river that runs mostly underground, going some 40 miles underground before surfacing briefly near Orangeville. The river is very low now since we’ve had so little rain, but it was still cool to see. 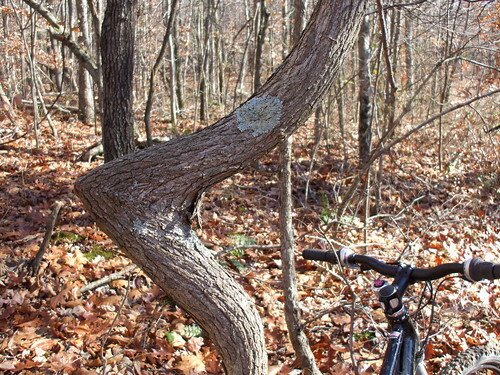 I can imagine how it must look in the spring when it’s strong. We stopped at a small liquor store along the way to pick up some beer. We were surprised at how decent their selection was and walked away with a six pack of Leinenkugel’s Honey Weiss. We also considered Goose Island’s Honker’s Ale and some Upland brews. One really cool town we passed through was Paoli. It’s a small town nestled in the hills with a beautiful square dowtown. The courthouse looked impressive against the backdrop of the surrounding hills. 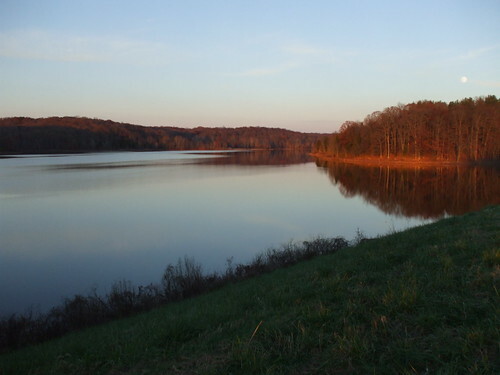 I’d definitely like to go and spend some time in Paoli sometime. 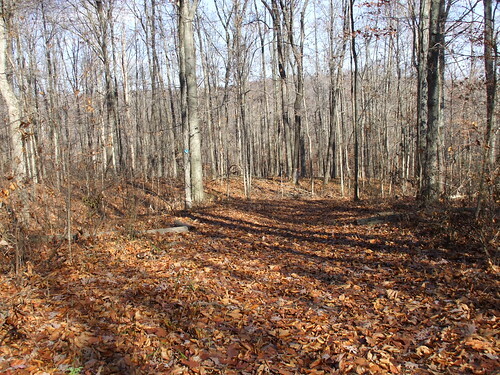 We passed several other trails on our way to The Oriole West trail. 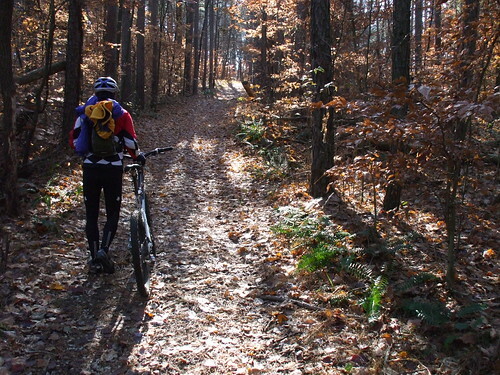 There are many trails in Hoosier National Forest, and a lot of them are open to bicycles. Most of them are “multi-use” trails though so they are also open to horses. Still, it’s pretty impressive just how many trails there are in the area. We arrived at the Oriole West trailhead to find a bunch of hunters. We decide to park a little further away so we could avoid too much interaction with them. We got ready to start riding and we both felt pretty cold as it was in the 30s. I knew we’d warm up once we started riding, but that was little consolation at the moment. 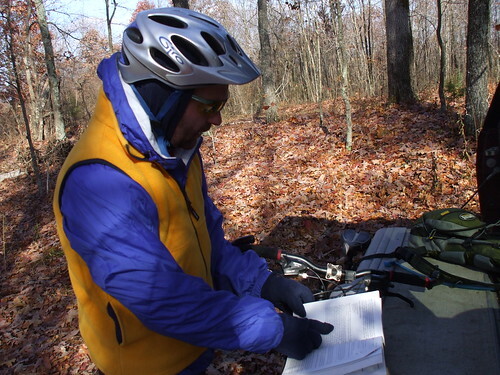 To keep us visible to hunters, Dave had a bright yellow vest but I just had my blue jacket. Fortunately, he brought a bright orange shirt for me to borrow. It looked completely stupid, but I was glad to have it. 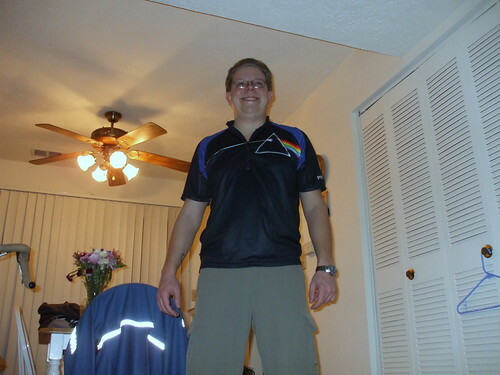 Yea, though I ride through the valley of the shadow of hunters, I shall fear no gunshots; for I wear bright colors. Our ride started with a brief jaunt over to the trailhead almost immediately followed by a screaming descent into the valley below. Leaf cover was thick and it was very difficult to see the trail and completely impossible to see most of the roots and rocks and other obstacles on the trail. This meant riding over a lot of rough stuff we’d normally try to avoid simply by virtue of not being able to see it. Throughout this downhill section, the trail stayed pretty straight and had a number of whoops which allowed us to catch some fantastic air. I had been pretty groggy during the drive down here but it didn’t take long before I woke up, flying down the hill and jumping a couple of times per minute. The bottom of the hill was particularly steep and sketchy with a lot of rocks to navigate. It also dumped us directly into a tricky creek crossing. While that descent was a real blast, after a few minutes of riding in the valley we had a ton of climbing ahead of us. We figured we probably climbed for the next three miles solid. And while it wasn’t super technical, there were a lot of rocks to deal with in the trail and traction was poor; the leaves made things slick but the ground was a bit muddy beneath the leaves. I had a lot of trouble with my rear wheel spinning out while I tried to climb. And we really didn’t expect the climbing to go on for so long. The scenery was really great though throughout all of this. As we climbed we could see into the ravines below us and eventually could see some of the surrounding hills through the trees. Unfortunately we didn’t get to enjoy it too much as we were getting our asses handed to us by the climb. We walked a few sections we couldn’t seem to make it up and few others to conserve energy, as we knew we had a bunch more riding ahead of us that day. 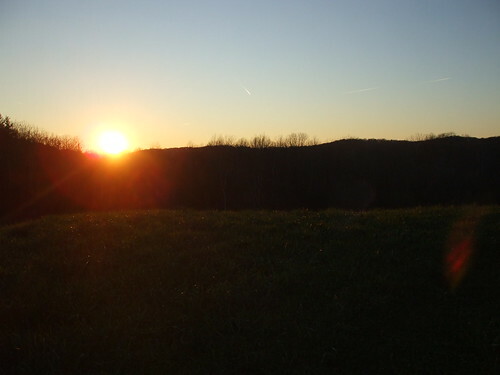 We rode along the ridgetop for a little ways but even then we continued climbing gradually. However, before long our efforts paid off with an absolutely incredible descent. For a while the trail wound back and forth as it swept down the side of this huge hill, with some fun switchbacks and rocky technical sections. We had to keep our speed in check due to the traction problems I mentioned, but the turns were wide enough that we could keep moving pretty well. After a bit of this twisty descent, the trail leveled out a little bit and gradually descended as we rode across the side of a hill with whoops allowing us to get some more airtime and then went into a full-bore straight ahead downhill run. Most of the downhill sections on most of the trails we ride don’t offer many runs straight down the side of a hill, so we really relished bombing down this hill. Unfortunately about two thirds of the way down the hill I saw Dave move over to the left and slow down to stop and I saw a puddle ahead of me followed by a dirt mound. Dave had just moved to the shallowest part of the puddle, so I couldn’t go there, and I couldn’t stop in time. I thought I could just ride over it but the puddle was deeper than I thought and it sucked my front wheel in. My bike stopped and I kept on going, flying through the air but still landing partially in the puddle. My landing was surprisingly soft considering I must have been going 15-20 mph on impact. 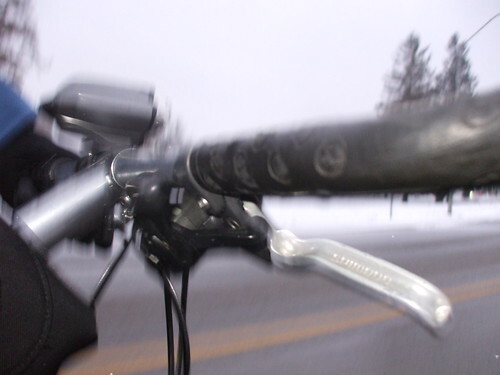 But my fork absorbed a lot of the impact and I had shifted my weight pretty far back, so most of the energy was absorbed by the fork and by pivoting my body over the bike. I wasn’t hurt but I was very wet and cold and this being a horse trail I knew that what I had landed in wasn’t the purest of water. It was quite disgusting and my body and my bike were covered in mud and water from the puddle. The culprit. You can see bunched up leaves where I tried to brake. The puddle doesn’t look very deep … does it? Dave and I dusted ourselves off and regained composure, laughing about what had just happened. I have to say, my crash was surprisingly invigorating and fun. Of course I wouldn’t have felt that way if I hadn’t escaped unscathed. The rest of the descent had a lot of twists and turns as before and we took it a little easier. As we rode, Dave noticed his front tire was going flat. He had had a slow leak for a while, but it became a fast leak. He pumped up the tire and rode a little more but it wasn’t holding air. I had a patch kit but we decided to walk back because we had reached the bottom of the hill anyway and now just had to go about a mile back up to the car. I would’ve been fine fixing it there but after this we were going to a cabin a friend of Dave’s owns and could fix the tire there over a beer. That sounded pretty damn good to me. Next time I wouldn’t mind trying this trail in the opposite direction (we went clockwise). I it’d be a lot of climbing either way but I do think the parts we had to climb this time around would be a lot of fun going in the other direction. We went over to the cabin which as it turns out isn’t really a cabin — or it’s a cabin with one wall. It’s more of a shelter. Dave showed me around his friend’s property where they gather with a bunch of friends several times a year to have parties. It sounded like there had been a lot of good times there. I got to see where the outhouse had burned down a few weeks before and a new one was already being built in its place. Dave was going to just replace his inner tube but realized he only had tubes with Schrader valves and his new bike takes Presta valves, so I offered to patch his tube. He accepted and before long he had a functional wheel again. The Leinenkugel’s Honey Weiss hit the spot after our ride … very refreshing and tasty. 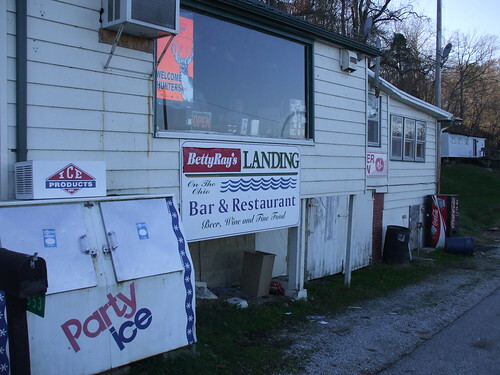 To make a long story short, we went over to a bar (I should say *the* bar) in this tiny town of Magnet, Indiana and ran into a friend of Dave’s there. It was a little weird because this guy actually lives in Indianapolis, which is further from Magnet than Bloomington. Quite a coincidence. This place reminded me a lot of the Port Hole Inn near Bloomington, a dive mostly filled with hollering rednecks although one table of guys had arrived in a limo. This was pretty puzzling but I didn’t try to understand it. I guessed it was a bachelor party but really, who knows? Anyway lunch took forever but I had a fantastic double bacon cheeseburger. I only ordered a single but I was glad to have the double and the waitress only charged us for a single. The same thing happened to Dave. After eating and talking to Dave’s friend it was getting surprisingly late in the day. The flat tire had also been a setback. 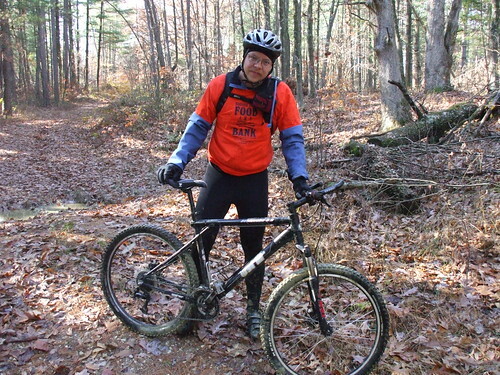 We debated whether we had time to ride one other trail. We had three planned for the day and while I knew that was ambitious, I thought we’d certainly get to ride two. We decided to go for it even if we were a little tentative about it since neither of us brought lights. 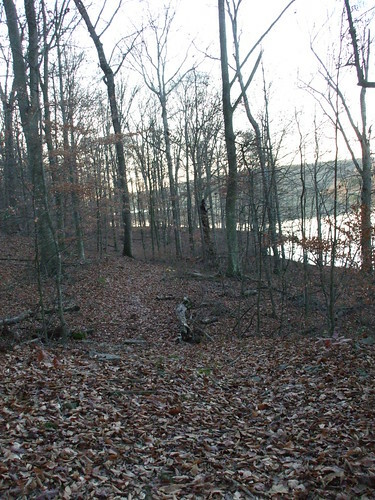 Unsurprisingly, the Tipsaw Lake trail loops around Tipsaw Lake. We didn’t see the lake at all until we had ridden a bit. 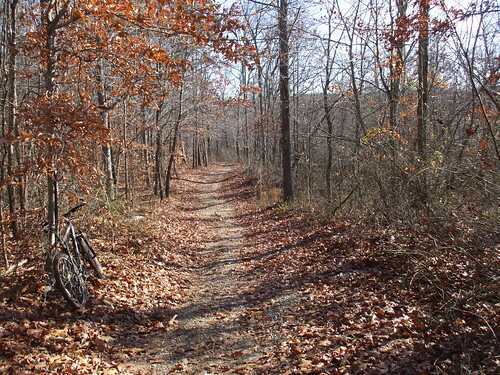 This trail was covered in leaves like the Oriole trail but was a lot flatter. There were some small descents and climbs but it mostly stayed close to the water and therefore stayed flat. This trail has something like 21 creek crossings and while most of them were dry they were still quite a challenge. In fact one of the first things you do on this trail is cross a pretty wide creek — this one wasn’t dry and I was worried my tire would slip on a rock and I’d fall into the icy water. But we both made it across safely and without getting wet. 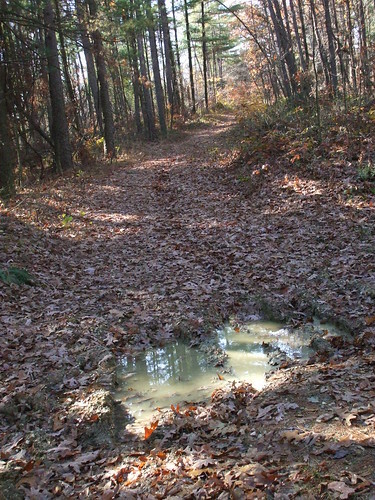 Even though it was fairly flat the trail had a lot of rocks in it which kept traction to a minimum and since we couldn’t see them through the leaves it was difficult to know how to handle the technical sections. I kept my weight back and tried to keep my speed up so I could roll over the rocks. It seemed to work pretty well. 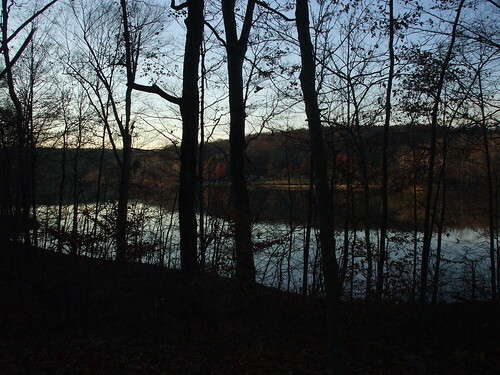 Before long we got our first glimpse of the lake. The golden late afternoon sun angling over the lake and casting long shadows made for some breathtaking views. The trail. Seriously. I swear it’s there. 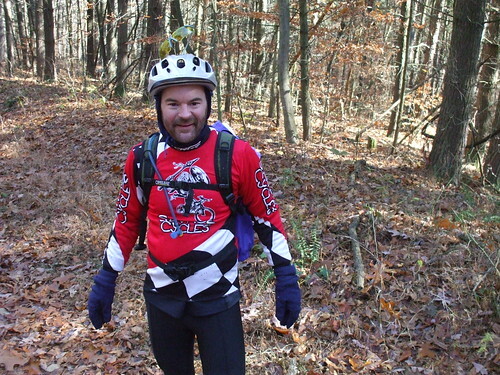 I was glad Dave had ridden here before because it was damn near impossible to follow the trail. He knew more or less where it went and it was very helpful being able to follow him. The trail was very different from the Oriole trail although both are pretty rugged, and I really enjoy these more rugged trails. The pristine trails at Brown County are fantastic and are incredibly well-designed , but these trails have a character of their own. As I put it to Dave, “At Brown County, you aren’t going to bomb down a hill hitting a puddle, flying over the handlebars and getting drenched in horse urine. 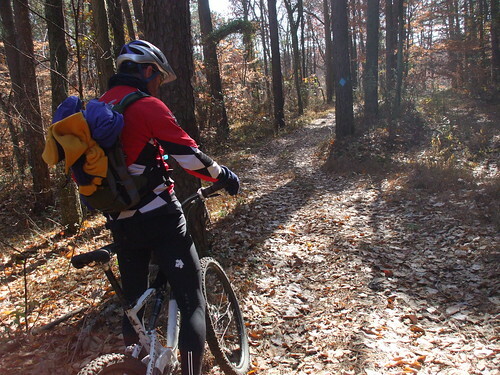 You have to ride at Hoosier National Forest for that.” Seriously, though, these trails may not be as well-designed but the scenery is incredible and riding on rawer trails has a different set of challenges. It also sometimes feels more natural to me than a well-groomed race track through the woods. 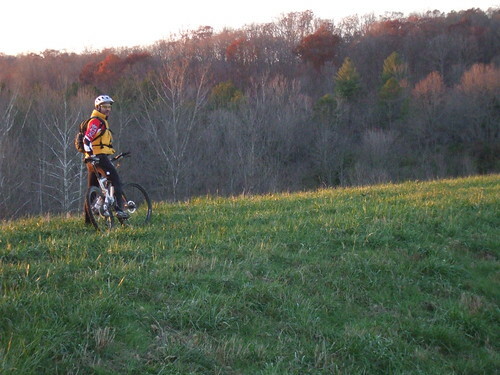 At the same time, I can’t help but wonder what these trails would be like if they’d been designed by the HMBA folks. It kept getting darker but we got a little more confident that we would make it around the lake before it got too dark to ride. As the sun went down the moon was coming up and it was almost full. We could have finished the ride by moonlight if necessary and in fact for the last few minutes it was mostly the moon guiding our way. We were cold and struggling to see, hitting every rock and root along the way. But it had been a great day of riding and even if we didn’t get to ride as much as we had hoped, it was quite an experience and much better than spending Black Friday fighting hordes of people at the mall. I’d really like to return to this area with Sarah and explore it more, taking some photos and going hiking and doing some more riding. Tipsaw Lake in particular was fantastic and I wish they rented boats there because it’d be the perfect place to go canoeing. They also have a beach and a campground complete with showers. Sarah and I went to Big Red Liquors’ 15th Annual Beerfest last night, which features over 200 different beers. 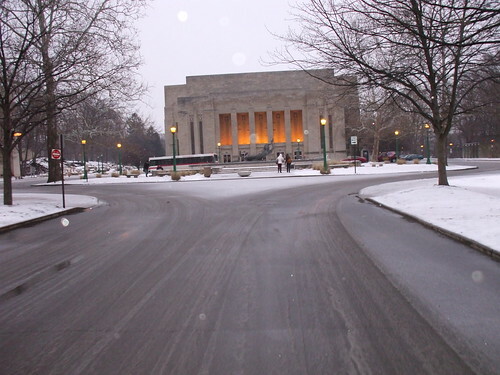 It was held at the Bloomington Convention Center from 6-9 pm. We met up with a couple of her classmates from IU’s School of Library And Information Science. We had a great evening of drinking beer and talking about libraries. I felt a little out of place being a Web developer amongst library science students, but it was fun and I know enough through Sarah (knowledge tends to rub off, you know) that I could keep up most of the time. We got pretty drunk and walked around in the rain debating where to eat, eventually settling on the Irish Lion where we drank some more (I had some really tasty Mead) and ate Celtic Stew and cheese. Beer-wise, we found some really fantastic brews. Of the local beers, I just loved Upland’s new beer, a black lager whose name I can’t remember right now. It’s not available yet, but I’ll definitely be buying some of that when it comes out (Upland is our favorite local brewery). We tried some beers from the Oaken Barrel Brewing Company in Indianapolis that were good but not great. I had heard good things about Bloomington Brewing Company’s Java Porter, which I finally tried and really liked. The coffee flavor was a lot stronger than I expected. We all really enjoyed the Schlafly Pumpkin Ale — it had just the right amount of pumpkin and some good spice. I also spent a good 10 minutes at the Breckenridge Brewing Company’s table sampling everything they had to offer. Sarah and I had had their Vanilla Porter before, which we call “The Milkshake of Beers,” but that’s the only thing we’ve been able to find. Their Oatmeal Stout was fantastic and I really enjoyed their Amber as well. The guy at that booth also recommended a couple of places to buy Breckenridge locally, so hopefully we’ll actually be able to buy some of this stuff. I also noticed after trying Upland’s new Black Lager that Sam Adams has a Black Lager too. I tried theirs and it was good, but Upland was better. One thing that surprised me is how much I enjoyed stouts. I have never been too into stouts but I found some great ones last night. The Breckenridge one was great, as was Bell’s Kalamazoo Stout. I also enjoyed Saint Peter’s Stout and I think a couple of others, but my memory is a bit hazy for some reason. One more thing I’d like to mention is Leinenkugel’s Apple Spice Beer was really good. Sarah brought over what I thought was a hard cider and I took a sip and was very impressed. I was a little surprised when she told me what it was. Good stuff.